The main thing is to spend these days between scissors, glue and papers, and to create a space for knowledge, experimentation, exchange and debate. In the first session we will make a review of the history of collage. From Picasso to collage nowadays. 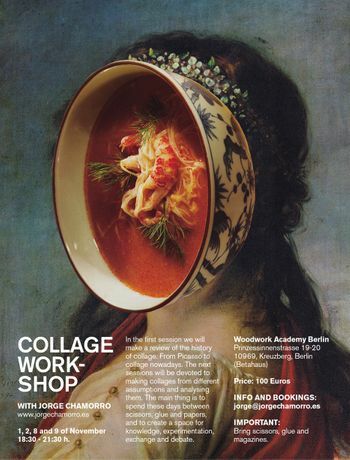 The next sessions will be devoted to making collages from different assumptions and analysing them. The main thing is to spend these days between scissors, glue and papers, and to create a space for knowledge, experimentation, exchange and debate. Jorge Chamorro (Madrid, 1972) is a graphic designer, teacher and collagist. He worked as a graphic designer for several studios, until he set up his own studio in Madrid in 2005, where he develops communication projects for different clients. He combines his work as a designer with teaching graphic design, collage or typography. Besides designing and teaching, he develops artistic projects, mainly collages. He has exhibited regularly in a variety of venues around the world and his work has been published in many international media. His collage work is always analog, without digital manipulation, using only photographs, scissors and glue. * A minimum of 6 attendants is required to run the workshop. If this minimum is not met, payment will be refunded.